The Vale of Pickering (the Vale) is located in East Yorkshire, Eastern England, approximately 10 km to the southwest of Scarborough. During the Quaternary geological period, the Vale lay just to the south of the maximum limit of the Late Devensian glaciation (Figure 1) — the last major glaciation to affect the UK (Bowen et al., 1986; Clark et al., 2012; Böse et al., 2012). Figure 1 A map of the UK and adjacent areas showing the location of the Vale of Pickering and the extent of Quaternary glaciation (after Bowen et al., 1986). The Vale forms a broadly west-east trending area of low-lying ground that is bounded to the north by the Tabular Hills, to the south by the Howardian Hills and Yorkshire Wolds (Figure 2). In contrast to the surrounding hills, the relief of the Vale is relatively flat with few notable hills or visible deep valleys. This distinctive landscape reflects a relatively complicated recent geological history that was produced by a range of geological processes. The latter stages of its geological development occurred when the Vale was impounded to the west (Vale of York ice) and east (North Sea ice) by lobes of the last British-Irish Ice Sheet and a vast glacial lake formed (Kendall, 1902; Murton and Murton, 2012 ; Bateman et al., 2015). This lake appears to have been linked to an adjacent glacial lake — Lake Flixton, situated to the east of the Vale (Candy et al., 2015; Palmer et al., 2015), with their water levels and patterns of sedimentation patterns apparently controlled by ice-damming and overspill (Murton and Murton, 2012). Figure 2 Digital elevation model showing the topography of the Vale of Pickering. Colour- ramped and shaded NextMap Britain elevation data from Intermap Technologies. The scope of this report is two-fold: firstly, to provide a brief and easily-understandable overview of the recent geological evolution of the Vale of Pickering (see The Quaternary history of the Vale of Pickering); and secondly, to summarise the various datasets that provide information about the Vale (see Relevant geological data, Review and interpretation of selected Single Onshore Borehole Index logs and Cross section interpretation. ↑ BOWEN, D Q, ROSE, J, MCCABE, A M, and SUTHERLAND, D G. 1986. Correlation of Quaternary glaciations in England, Ireland, Scotland and Wales. Quaternary Science Reviews, Vol. 5, 299–340. ↑ CLARK, C D, HUGHES, A L, GREENWOOD, S L, JORDAN, C, and SEJRUP, H P. 2012. Pattern and timing of retreat of the last British-Irish Ice Sheet. Quaternary Science Reviews, Vol. 44, 112–146. ↑ BÖSE, M, LÜTHGENS, C, LEE, J R, and ROSE, J. 2012. Quaternary glaciations of northern Europe. Quaternary Science Reviews, Vol. 44, 1–25. ↑ KENDALL, P.F. 1902. Glacier-Lakes in the Cleveland Hills. Quarterly Journal of the Geological Society, 58, 471–571. ↑ 5.0 5.1 MURTON, D K, and MURTON, J B. 2012. 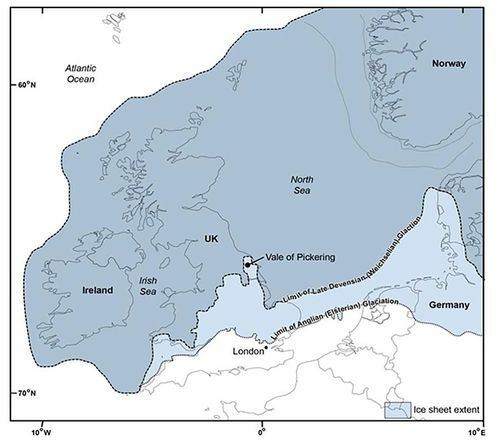 Middle and Late Pleistocene glacial lakes of lowland Britain and the southern North Sea Basin. Quaternary International, Vol. 260, 115–142. ↑ CANDY, I, FARRY, A, DARVILL, C M, PALMER, A, BLOCKLEY, S P E, MATTHEWS, I P, MACLEOD, A, DEEPROSE, L, FARLEY, N, KEARNEY, R, CONNELLER, C, TAYLOR, B, and MILNER, N. 2015. The evolution of Palaeolake Flixton and the environmental context of Star Carr: an oxygen and carbon isotopic record of environmental change for the early Holocene. Proceedings of the Geologists' Association, Vol. 126, 60–71. ↑ PALMER, A P, MATTHEWS, I P, CANDY, I, BLOCKLEY, S P E, MACLEOD, A, DARVILL, C M, MILNER, N, CONNELLER, C, and TAYLOR, B. 2015. The evolution of Palaeolake Flixton and the environmental context of Star Carr, NE. Yorkshire: stratigraphy and sedimentology of the Last Glacial-Interglacial Transition (LGIT) lacustrine sequences. Proceedings of the Geologists' Association, Vol. 126, 50–59. This page was last modified on 20 January 2016, at 17:42.